For WO Pat Murphy and his crew mates it was almost right down to business. Arriving at 419 Squadron on April 17th, 1944 from No. 1664 HCU were Pilot T/S Chuck Thomas USAAF, Navigator F/S Bob Lindsay, B/A Sgt. Ritchie, F/E Sgt. John Thompson, M/U Gunner Sgt. Arnold Greene, and rear gunner Sgt. Vic Knox. There was little time for squadron exercises as Murphy waited for his captain to complete his two sorties as 2nd. Pilot. Thomas completed them on the night of April 20/21 and was ready to take his own crew on squadron operations. 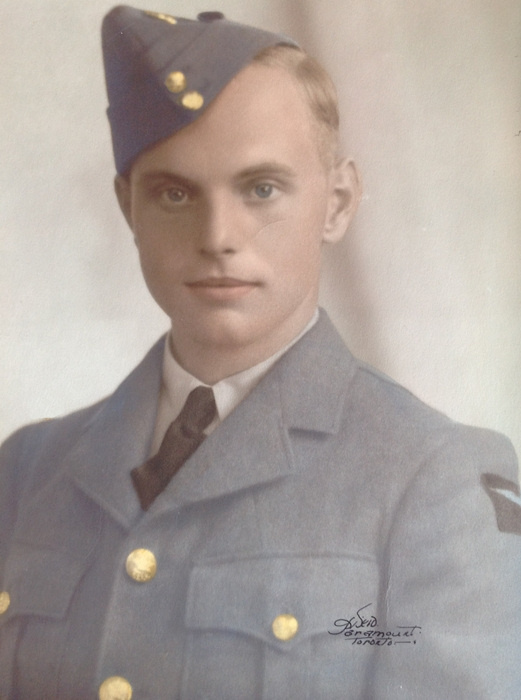 The squadron's very next operation on April 22/23 and WO Murphy was to meet the crews replacement Bomb Aimer, F/O John Neal at the Breifing Hut just minutes prior to embarking on the op. Sgt. Ritchie had been hospitalized with jaundice and F/O John Neal had asked to go with the new crew, Neal who already had completed a number of operations had just returned from Leave. Murphy had almost no time to become acquainted with the new crewman, who as a veteran did his best to give Murphy and the others of the crew an air of ease. After the briefing everyone went to dinner, all of the crew going to the NCO Mess while the new B/A went to the Officers Mess. The crew were not altogether again until they boarded the truck to the dispersal pad of Halifax VR-J, HX189. Then it was just for the traditional christening of the tail wheel before boarding. The trip to Laon was short only two hours each way, in Neal's mind a "Milk Run" and an easy credit towards his Tour total. Chuck Thomas started up the engines, awaited for the gauges to show the correct head temperatures before rolling down the perimeter tracks to join the already marshalling Halifax bombers. At 2030 hours they were airborne headed South over England crossing at Head and extinguishing the nav lights as they left the friendly territory and headed across the Channel. For Wireless Operator Murphy his last communication with base was moments prior to takeoff, a short message to ensure he was on the the correct frequency for the night. From here on he would only be listening for incoming messages on weather, wind and any other details which may have changed since the aircraft took off. For him to send any messages would be to give the aircraft away. For the next hour and a half it was listening to the static on the wireless and searching out any enemy fighters in the darkness visible through the small window like port next to his position on the port side while the aircraft droned on into the night. From his position he could not see Neal in the darkness surrounding them all, as the B/A moved from checking through the astrohatch for night fighters to his position in the nose, but he could hear him over the intercom. From his intercom Murphy could hear Neal guide the Halifax to the target, it must have been some source of relief as Murphy knew they were over the target and no sign of enemies resistance had appeared. Everyone on the Halifax could feel the bomb doors open when two loud bang noises were heard and through the intercom a voice asking "what's that" then another loud noise this time a thunk followed by a vivid flash of light that illuminated the whole aircraft. With the intercom knocked out, it's strictly word of mouth what what had happened. Both port engines and port side of the fuselage is on fire. The side closest to Murphy's radios. WO Murphy finds himself wounded with blood streaming down his face. Thomas is yelling to everyone "get the hell out". The bombs still in the bomb racks in danger of exploding, as Neal returns to the nose to release them after setting them to "Safe". With wounds to his legs in three places as well as a cut on the head, Murphy works on the escape hatches in his area open after what seemed like an eternity the stuck hatch gave way. Here for maybe only the third time Murphy comes face to face ever with Neal. Murphy yells for Neal to "get out, get out" . The B/A and Navigator get out through the nose hatch. Then Patrick Murphy, Greene and Thompson use the other escape hatch as Thomas does his best to steady the falling aircraft. And although wounded Thomas still maintains control of the aircraft which has now turned North because of the lose of the two port engines. Thomas manages to escape the aircraft, but all efforts to contact tail gunner Sgt. Knox in his position almost half the distance of the aircraft away from everyone else, fail and it is assumed he was killed by the JU88 which had manouvered up on them from below and behind. On the Ground - And a Participant in the "Long March"
On this his first operation, Wireless Operator Murphy now found himself descending by parachute and becoming a Prisoner of War. Initially sent to Stalag Luft VI before being moved as many other air force NCOs were to Stalag 357. Stalag 357 was part of a large complex of camps based around the German barracks on the outskirts of Fallingbostel. With the Soviet army advancing on Poland, the Nazis made the decision to evacuate the PoW camps to prevent the liberation of the prisoners by the Russians. Other reasons have also been given for the orders from Berlin to march tens of thousands of Allied prisoners away from the front lines. The march from Stalag 357 for many would mean death from illness, starvation and the German Guards. For WO Murphy it would mean the loss of a number of friends. In a way that should never have happened and was blocked by RAF records for many years. "Overhead was the usual sound of the RAF fighters but, suddenly, the sound changed to show acceleration and diving. I heard the sound of machine gun or shell fire. I was on the field side of the hedge and saw rocket firing Typhoons swooping onto us and the realisation struck home that we were the target of a squadron. I still had a homemade pack on my back and, in one movement, I dived over the hedge into the ditch on the other side and crouched behind the bole of a tree. I saw one man run into the field waving a RAF overcoat which had a white blanket like liner. He was hit, and others, too. Some of whom caught a packet diving for the ditch. Many of the casualties were in that ditch, but without the benefit of the bole of a tree. One of the fighters throttled right back and climbed. The next plane came low and slow abreast of us and had a good look. The next wiggled his wings as in greeting before the whole squadron flew away. It was almost as though one of the pilots had believed something was wrong." Goodman goes into graphic details of the damage incurred on the men killed that day. For the reader of his narrative of the events, it is simple to skip past those pages. In the memories of men like Patrick Murphy who were there and also saw the horror and being friends of some of these men, the mind can never forget. It was something that forever stayed with Pat Murphy. Among the 30 men who were Prisoners of War and killed in the attack were two 419 Squadron airmen WO Warren Elwood McKenzie of Halifax DT731 and WO Robert Douglas of Halifax DT669 , who may have been one of the men who became friends with Murphy.